← Human Rights: Fit For the 21st Century? 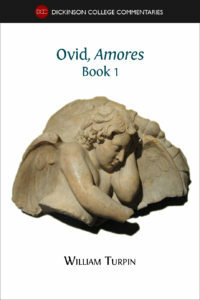 I chose to focus on Amores (Book I) because Ovid’s text seems particularly suitable for students at that crucial stage when they have learned the basics of Latin and are just starting on real Latin authors. In some ways it is easiest to make the transition by means of a prose author, and Bret Mulligan’s new edition of Nepos’ Life of Hannibal (also published by Open Book Publishers) is an obvious choice. But students and teachers are often impatient to get to the poetry. They typically begin with Catullus, but soon find themselves looking for more, and the Amores are an obvious choice, since the poems are fairly short and since Ovid’s Latin is relatively easy, or at least as easy as Latin poetry ever gets. Because users of this edition may well be relatively new to Latin, we have provided a lot of help in reading the poems aloud, in translating, and in understanding and enjoying them. The fact that the Latin text marks vowels that are long by nature with macrons should make reading aloud and translating easier, and the inclusion of recordings should help and encourage students to understand and reproduce the sound of each poem. Finally, the notes provide more help for a first-time translator than is perhaps usual even in editions intended for school and university students: the notes have been beta tested in a number of college-level classes, including some excellent students of my own in the Fall of 2015, and the process has revealed to me how much confusion and misunderstanding a Latin poem can produce. The Amores are interesting, and possibly controversial. I doubt if anyone thinks they are great poetry on a par with the famous poems of Catullus, Horace, and Vergil, and whether or not they are amusing is a question of taste. The main character, the poet himself, is fairly despicable as a human being: he is a selfish, tactless, and possibly violent seducer, whose “love” for his Corinna seems never to go beyond superficial attraction. In discussions of the individual poems, I often argue that the poet is inviting us to laugh at, and with, the character he has created. Our attitude, I suggest, is ambivalent, just as we may be ambivalent about someone like Joey in “Friends”; he is a fairly dreadful person, but we get sucked into his strangely self-regarding value system and end up wanting him to be happy. However that may be, the Amores provide an excellent introduction to Latin poetry. Reading elegiac couplets is a relatively easy way to learn the basics of Latin meter, including the dactylic hexameters of the great epic poems. And Ovid’s poems are more straightforward, and less emotionally complicated than those of his great elegiac predecessor Propertius. Ovid introduces us to various conventions of Latin love poetry: the male lover falling in love, the male lover languishing on the doorstep of his beloved, the male lover in a relationship but still dogged by jealousy, suspicion, and disappointment. This entry was posted in Author Posts, Uncategorised and tagged Amores, Latin poetry, love poetry, Ovid. Bookmark the permalink.